Commonly known as the Golden Cane palm, this palm is extremely popular in landscapes and gardens not only here in Australia, but in many parts of the world. Where it gets too cold to cultivate outside, Golden Cane palms make wonderful and happy houseplants. In fact, this plant has won the Royal Horticultural Society’s Award of Garden Merit. This palm offers many uses in style, and is a staple in any tropical or sub-tropical garden. Under cultivation, this palm generally grows to 6 metres in height, sometimes taller. It doesn’t have a central trunk, but grows several stems from the base, making its growth about as wide as its height. When left on its own, it’s good at creating many suckering stems. The palm fronds arch prettily out and down, and the leaves will die off from the bottom as the palm directs energies to the highest fronds, creating naked stems. The name Golden Cane comes from the yellow color of the petioles, and the yellow color of the inflorescence and fruits. This palm grows many stems and suckers from the base and needs to be heavily pruned to discourage looking unruly. If not managed, Golden Cane will spread much further and look unsightly. We suggest removing trees located near pools or slabs due to the pressure the increasing size of the base applies to soil, potentially cracking pool linings and even concrete. Trimming golden cane slows down the growth of the trunk as well as reducing its spread so is a reasonable compromise for tree retention. The inflorescences of Golden Cane are borne on peduncles under the crown shafts and above the naked stalks. Each leaf forms a “V” shape and is wonderfully filled with around 100 leaflets on each stem. There are normally 6-8 leaves on each long rachise. The fronds will drop off from the bottom, but a better look can be attained by removing dying and spent leaves. Expired fronds tend to get caught in-between stalks. Fruits are shaped like olives, each about 2cm long and are usually yellow in color but they can also sometimes be darker or purple. Golden Cane is known for being a palm under planted with seedlings from its own seeds. Take a cue from this and collect fresh seeds to start new palms. Seedlings will take over an area unless the seedlings are mowed over to keep from growing. Golden Cane can tolerate some amounts of shade, but enjoys a day of full direct sun exposure. They are adaptable to a wide range of soil types and conditions, but do best in moisture-retentive yet well-draining soil. They do not need to be fed extensively once established, but new specimens benefit from adding some amount of broken down organic matter into the planting hole when being planted. Allow Golden Cane lots of space, as this palm enjoys spreading out. They make great windbreaks and screening plants, and provide as much beauty as function in the tropical landscape. Due care must be taken to keep the seedlings from taking over, and many horticulturists agree that keeping the lower stems and fronds cut and clean makes this palm look better. Good and aggressive management to keep from spreading will help keep this palm’s willingness to expand in check. 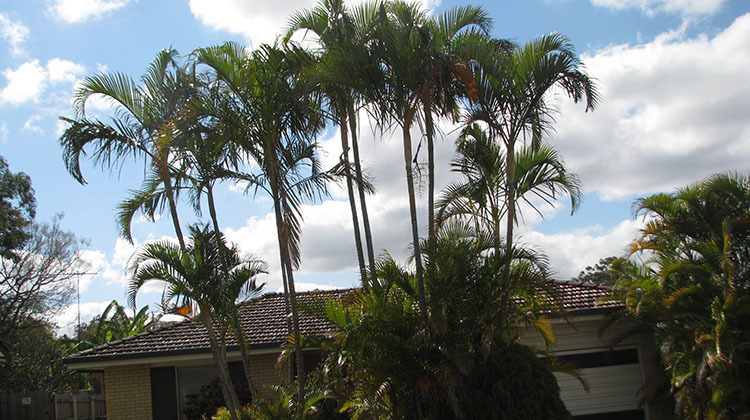 Interestingly, while this palm is prolific in Brisbane it is considered rare in its native environment. Arborists often see damage they have caused from being planted near pools and on retaining walls. The trunk of Golden Cane palms can easily damage structures and even their roots destroy retaining walls. Hi, we have approximately 25 Golden Canes at 2m spacings along a boundary line. They were planted 7 years ago and most have multiple mature canes 2-3m high. There is almost no new growth from the base of the clumps of long canes. Is there any way to promote new suckers to grow? I have several clumps of golden canes around my pool. I remove the seed clusters before the seeds are formed as they can block my pool cleaner. Does this harm the plants and can I eat the young nuts? I’m calling from Ghana west Africa. I want to know if these canepalm plants have got any spiritual benifits. Hi David we have some fully grown golden canes that are dieing after our neighbours house burnt down. It looks like chemicals may have been poured in that area by the fire brigade as a near by Sheenas Gold is also showing signs of die back. Would you have any suggestions as to what to do? I have two pots of Golden Canes, I have been mulling over where to put them for about two years. After reading comments regarding Golden Canes, re root system, fruit bats etc. I have decided not to plant them in the ground. Intending to propagate some Golden cane,hopefully reaching out for some overall guidance selection depth of planting and etc. Hi David we have golden canes nearly fully established 2 meters from pool no roots when dug hole for pool is it still ok ? We love them but see they do have roots that run and closer to our sewer line across the back should I move them there different opinions out there ? David could you please tell me if after purchasing a two metre tall one from a well known home improvement chain in Brisbane (to keep as a container plant) is it necessary to sun harden it? or can it go out in the full sun straight away? Hi Kathy. The trees from Bunnings in tree bags aren’t too bad, but my friends at Palms for Brisbane tell me all the ones in pots need to be sun hardened. That said, golden canes are hardy palms so you shouldn’t have to pamper them too much. I have two 27 year old gorgeous Golden Canes that have spread to the extent that they are pushing my paling fence over. Can I cut those 100mm thick stems off say 300mm from ground level WITHOUT RISKING THE HEALTH OF THE TREE. Probably need to cut off the outermost 4 on each tree. Hi Terry. There’s little risk if you prune them there. I’d go a little lower, say 50mm above the trunk. The reason is to limit the deadwood resulting from the pruning, but really golden canes generally respond well to the removal of stalks. Hi Lynn. Golden cane palms are very hardy and in my experience normally survive the removal of most large stems. Take care if you are doing it yourself as the stalks are heavier than they might seem. Can these evade structures? We have large unkempt golden cane’s bordering our apartment’s ubderground car park. It depends on your soil type. These palms only have ~10mm diameter root tendrils but the ~1m base finds its space by pushing against the soil. If you have a soil that doesn’t easily compact it can apply enormous force to a structure. I’ve seen many retaining walls damaged by D. lutescens. I recommend against planting or maintaining golden cane palms within six metres of any structure. 2. Combatting mealy bug in the palms. I have several mature golden cane palms that are probably 5 metres tall at least. I would like to remove the really tall canes because they don’t look all that attractive and they drop large fronds into the pool. Will the smaller canes survive if I cut out the tall canes? Your info seemed the most helpful, thank you. What is the nest soil mix to fill the hole with please. They are 1.8 m high and have multiple stems at the base, they look awesome. Upkeep, what is best for them please,. I’ve noticed you mention that the Golden Cane Palm’s roots system can damage structures. I have read that they are often used around pools etc because they don’t have an invasive root structure, can you confirm this for me please? My palms have a lot of seedlings, can I take them and replant them to create more trees? What is the best way to remove /kill Golden Cane pups which have fallen and are growing around the bas. Dig them out or use some kind of spray? Good pick-up. The petiole is the stalk of the leaf from the stem of the plant to the leaf blade, or to the first petiolule (stem of leaflet) as in the case above. The rachise is the spine of the leaf from where the blade or petiolules start to the tip of the leaf. So, the spine of the leaf has two names depending on where on the leaf it is located. I’ll add some definitions to the tool-tips for these terms so they’ll show up when you hover over them from now on. You call the leaf stalks petioles and rachises. Are there two names for the same thing or is there some time when one should be used over the other?